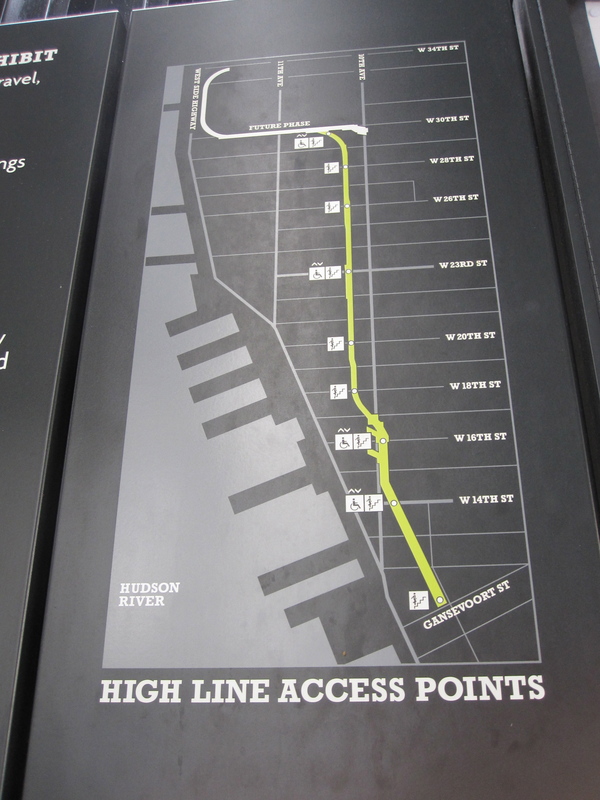 36 Hours In NYC – Gotham Bar & Grill, The High Line and More! If you can swing it, last-minute travel can be the way to go when exploring a city like New York. I had a weekend free and wanted to get out-of-town, have good weather, eat some great food, stay in a hotel with a nice view and celebrate an anniversary, oh and not spend a million dollars on a plane ticket. I know, a pipe dream. However, you can find great deals by booking hotel and flight together at the last-minute (I used Expedia). We were even offered a hotel upgrade upon arrival. Now we could focus on eating and shopping. The next thing was to find a restaurant that had an open table on a Friday night at decent time with a couple of days notice. Fortunately for me I was able to reach out to an old friend that hooked me up with an 8pm reservation at Gotham Bar and Grill. After checking out our lovely room view (support beam in the way but 2 sides of the room were wall to ceiling windows) we headed to Gotham Bar and Grill. To drink: Sauvignon Blanc “Te Muna Road” Craggy Range Martinborough, New Zealand. Hint of fruit and light, which was good because our dinner was not. AMUSE BOUCHE – Ceviche with some watermelon and some other delicious things that made me wanting more. GREENMARKET STRAWBERRY AND ARUGULA SALAD – Tokyo radish, marcona almonds and pecorino pepato white balsamic vinaigrette. A perfect start with the strawberries and arugula nice and fresh and the sweetness of the strawberry balances out the bitterness of the radish. 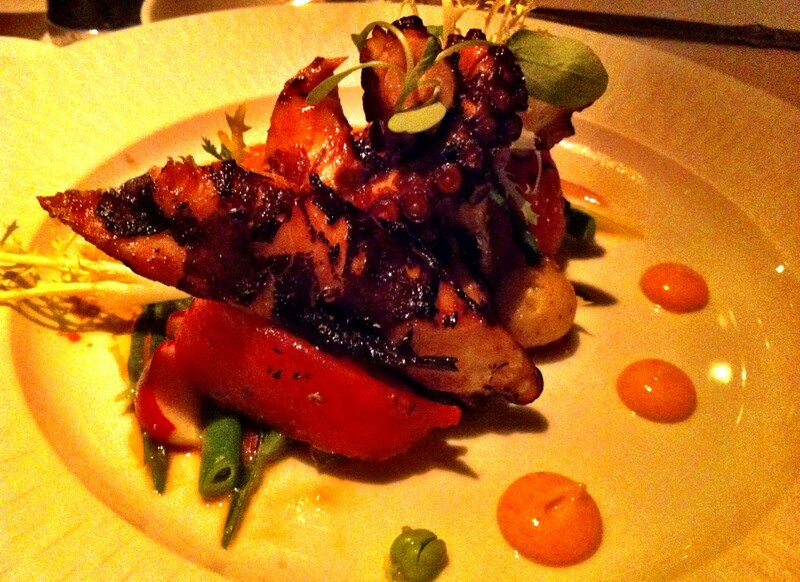 OCTOPUS: Great flavor (a lot of the time there isn’t a flavor at all) and not a hint of the rubber-like texture you usually get in octopus. bordelaise sauce. 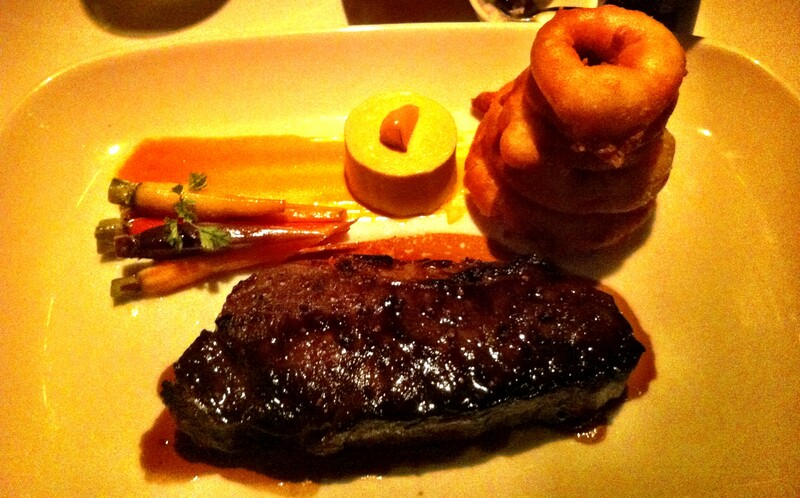 This was not my dish but the steak was cooked perfectly to the request medium-rare. What made me go slightly bananas was the marrow custard. I haven’t had marrow before but have heard it is delicious. However, there is something off-putting to me about it. Well I didn’t know what I was eating when I tried it but I couldn’t stop eating it and laughed when I found out what it was. No wonder. 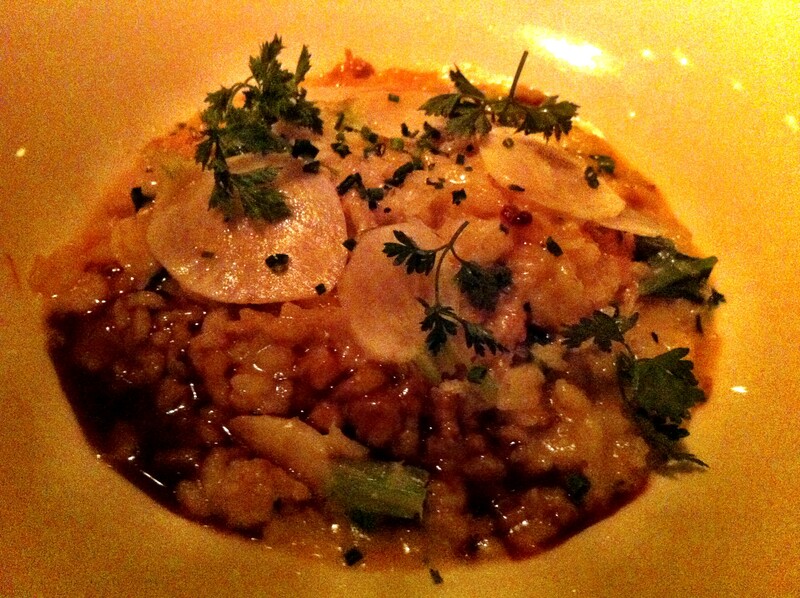 GOTHAM RISOTTO – chicken sausage, bacon, broccoli rabe and Tokyo turnips, Parmigiano Reggiano. This waitress recommended this dish and she knew what she was talking about. If you are used to being served larger portions after you take one bite you will understand why this dish is portioned as it is. This dish is so flavorful and rich you will be satisfied with just a few bites but wanting more so you will keep eating. The turnips and broccoli rabe lighten up the dish and add more flavor dimension (not that it needed it). Time for dessert. Well we were both stuffed and decided to go “light” with some sorbet. The sorbet came and then so did two, yes t-w-o dishes of chocolates and candies with a “Congratulations” and “Happy Anniversary” note. It was so sweet of them to do this and made me smile. Bellies full and wanting to go out we had some cappuccinos and got some recommendations from the servers (they know their food and their drink). We decided to go to Cielo to hear some music. We got up early to explore Soho. There was some bike race going on so some streets were blocked off which made it even easier to walk around with no traffic. I was still full but we had reservations for brunch at Balthazar. 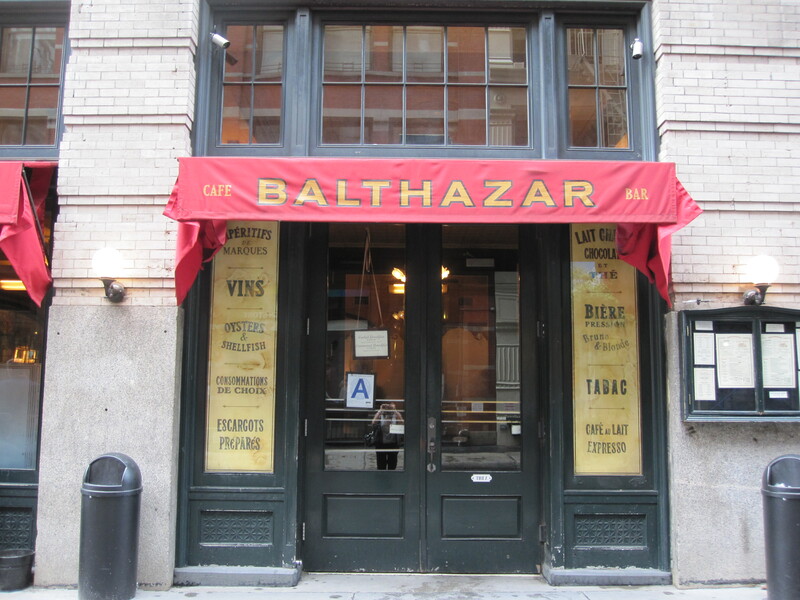 Balthazar is a French brasserie in Soho with a lively ambiance and classic decor; large antiqued mirrors, wood paneling and red leather booths. Despite being busy the service was great. My eggs benedict were good and definitely provided me with enough calories for the day. It was time to work off brunch and check out the shops and galleries in Soho. We came across this really cool sculpture that looked so realistic down to the water drops that looked like you could reach out and wipe them off. 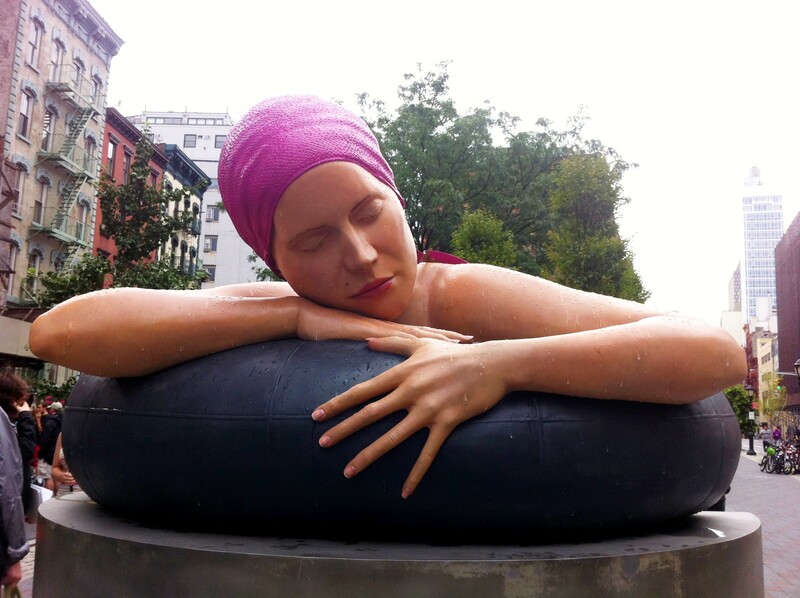 I am not sure of the name of it but I call it the Soho Swimmer Sculpture. After a long day of 6 hours of walking (Union Square farmer’s market to Central Park) it was time to consider dinner. 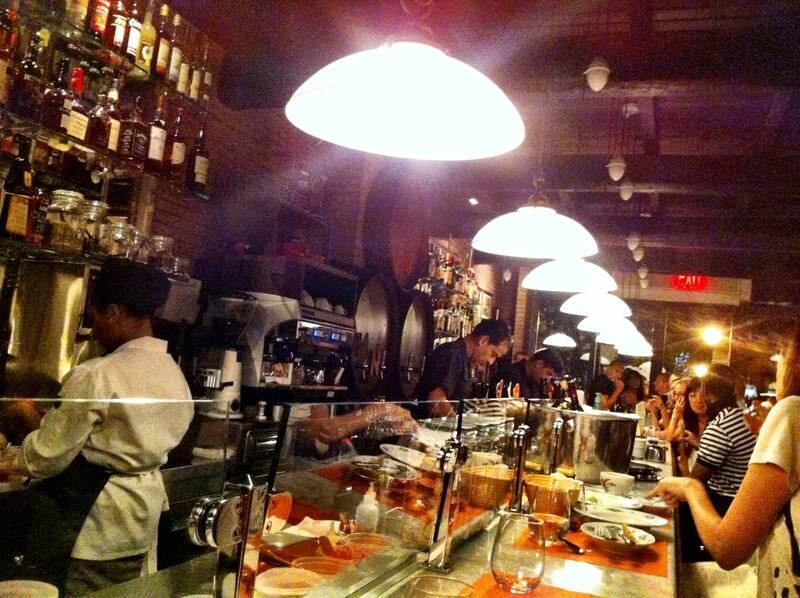 We decided on Osteria Morini in Soho. After my dinner and brunch I didn’t think I would be able to eat again but Osteria Morini proved me wrong. It was pretty packed but we snagged some seats at the chef’s table, the perfect place to watch the creation of incredibly delicious looking appetizers and dessert. Again, no camera and little notes but bottom line is this was a really great Italian restaurant that I will be recommending to anyone going to NYC. We started with the Rucola salad: wild arugula, peaches, speck and white balsamic. Peaches tasted so fresh and worked with the speck. 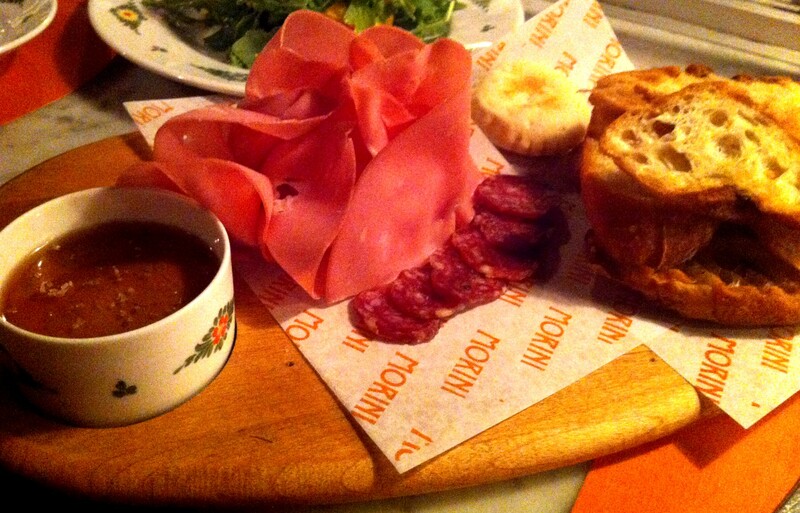 Next order was the Battilardo di Affettati (cured sliced meats with grilled bread & Tigelle Modenese). 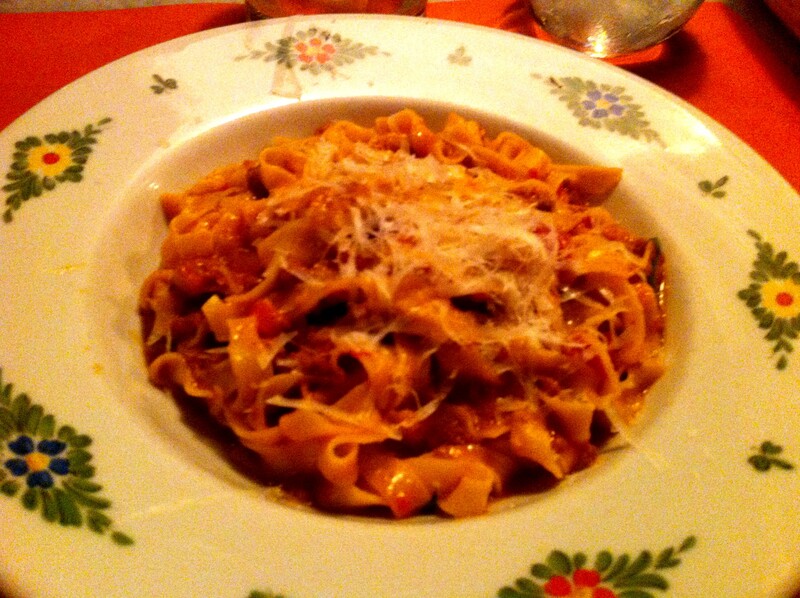 For the main course the Tagliatelle, wide ribbon pasta, ragu antica, parmigiano. I haven’t eaten a whole bowl of pasta in a while but this night I wasn’t sharing and I knew from the first bite I would eat the whole thing. The fresh pasta had just enough ragu for a hearty flavor but not over powering. 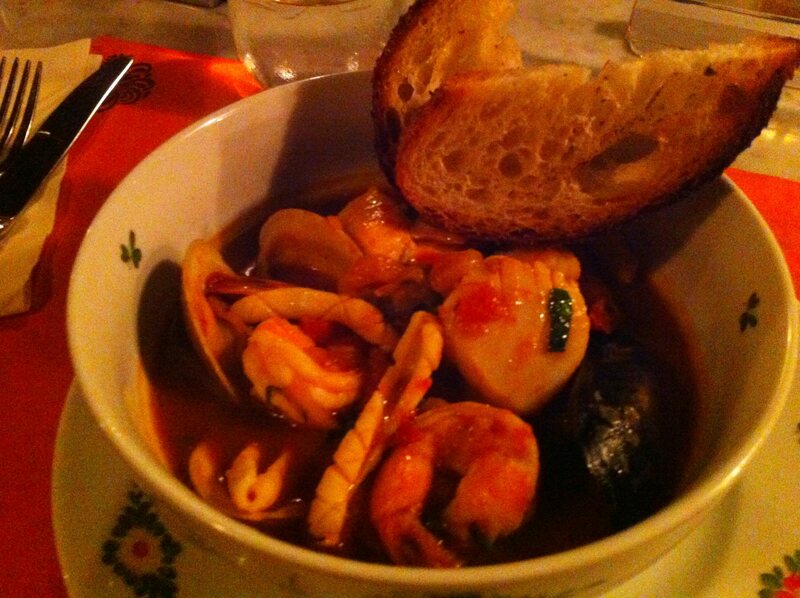 The second main course was Brodetto, with adriatic-style seafood soup of calamari, scallops, fish, shrimp, clams and mussels. I did not try this but was assured it was good. After dinner we headed to NYC’s oldest bar Ear Inn for a drink. Dating back to 1817 and on the National Register of Historic Building you definitely feel like you are walking into an old bar. I am pretty sure the floor is slanted and the place is full of nautical knickknacks, old photos and old wood. Ear Inn has a relaxed vibe and stiff drinks. They also serve food. We sat outside on the sidewalk and tried to imagine how much it has changed over the years. It seems the bar was stuck in time and everything else around it changed. Before heading back to Chicago I was able to fit in the Chelsea Market which is in a former biscuit company built in the 19th century. There are several shops and restaurants (that all looked very good) but was short on time so we stopped into a pop-up space. There were several vendors there and I managed to find the same vendor I bought a purse from about 12 years ago in Soho, Arza Design. She will be in Chicago at the Merchandise Mart later this year before the holidays. 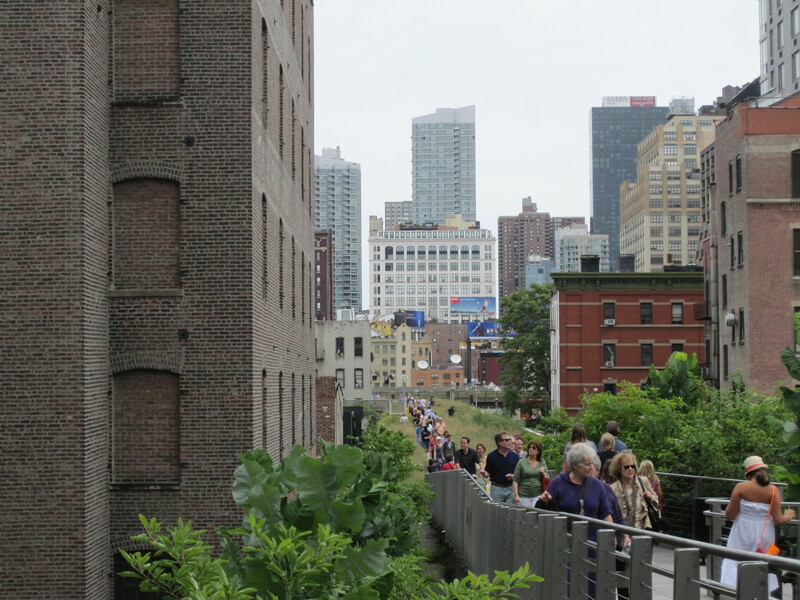 Last stop was the High Line, a railroad line built in the 1930s that has been turned into a park. It’s a beautiful green oasis in the middle of the city. 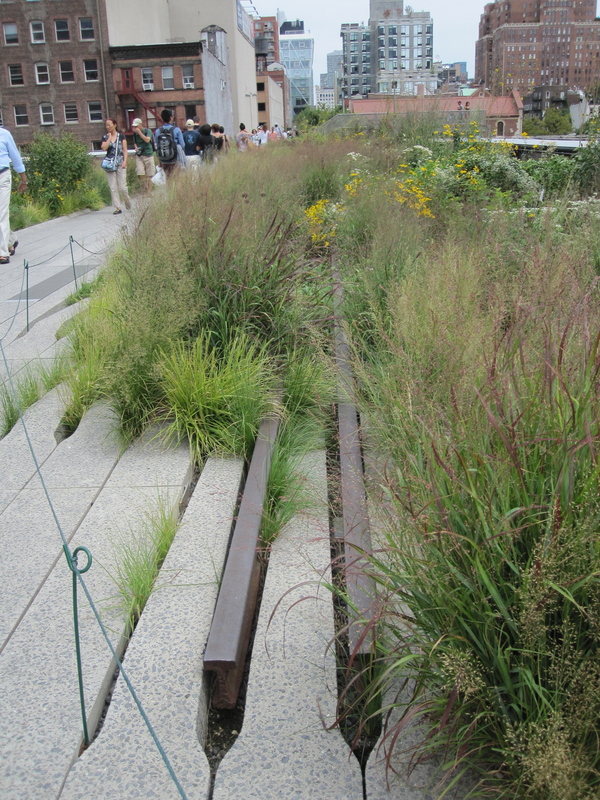 The design has clean lines and keeps the original railroad tracks, which you can see poke through the vegetation. I highly recommend it to anyone in need of some nature while in NYC. Alas, it was time to leave. 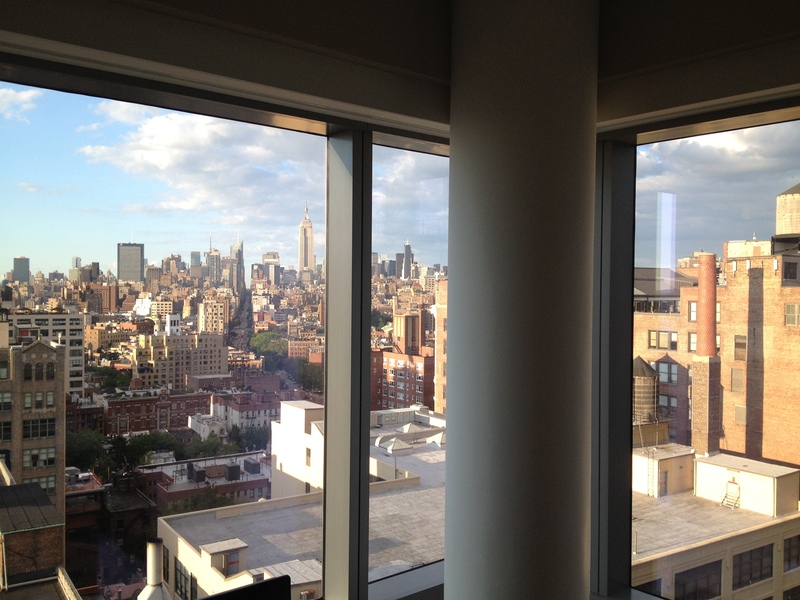 I will miss NYC and its energy. I am looking for an excuse to go back so if anyone has one, please let me know.